The borough will remain with Connecticut Resources Recovery Authority to collect waste, but is looking at using Connecticut Waste Transfer for recycling. NAUGATUCK — With a 20-year contract up in November, the borough has decided to stay with Connecticut Resources Recovery Authority (CRRA) to handle its municipal waste. Although private companies offered lower tipping fees than the a quasi-government agency CRRA, Sheila Baummer, Naugatuck’s recycling and solid waste coordinator, determined that once costs for driving times to facilities further away were factored in, CRRA remained the cheapest option. “The big stumbling block for us continues to be the distance we would have to travel,” Baummer said, during the Board of Mayor and Burgesses’ Jan. 3 meeting. The borough currently takes its refuse to a center in Watertown, but other companies have sites in Wallingford, Ansonia, and Bristol. Baummer recommended signing a five-year contract. Although a 15-year contract would save the borough an estimated $18,000 per year, a shorter contract would allow the borough to revisit its options sooner. “I think that if we bind ourselves to a 15-year contract, we may loose that advantage of that flexibility,” Baummer said. The board authorized Mayor Robert Mezzo to negotiate with CRRA for a five-year deal. But, the borough is still weighing its options when it comes to which company handles its recyclable materials. The five-year contract will cost the borough $63 per ton of waste in the first year, after which market values will prevail. The contract includes a 6.5 cent disposal rate increase for every 10-cent increase in the price of diesel fuel after it hits $5 per gallon. Baummer said many private waste transfer companies are in the process of emerging, and the borough may be able to secure a better deal in a few years. The contract includes an opt-out if fees spike or recycling rebates drop. 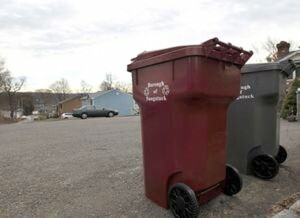 For recycling, Connecticut Waste Transfer (CWT) offered Naugatuck a $16.50 per ton rebate whereas CRRA offered $10 per ton. Also, the recycling rebate would be guaranteed through 2015 whereas CRRA’s rate may change each year. Baummer estimated that going with CWT would save the borough around $6,600 per year after factoring longer driving times to Shelton. However, she said heavy traffic on Route 8 could eat into those savings and make it more difficult for drivers. “It didn’t seem like the $6,000 was enough two chance the traffic,” Baummer said. Last year, CRRA charged the borough $627,900 for dumping 9,100 tons of trash. The agency gave the borough a $7,383 rebate for depositing nearly 1,477 tons of recyclables last year. The burgesses asked Mezzo to try to negotiate a one-year contract with CWT to test that option before committing longer-term.